It is new Year’s eve. I step out of the market in downtown San Mateo with a few last-minute items and a passing shadow causes me to stop and look up. Several hundred feet above me, a 250 foot long zeppelin is passing directly overhead. Imagine an A380, puffed up like a football passing silently over you and you get the idea. 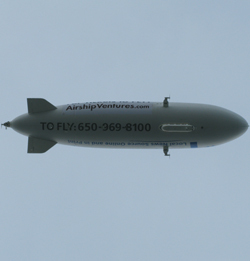 Eureka, Airship Ventures Zeppelin NT has been flying over the Bay Area for just over a year. It is one of only three zepps like it on the planet, and the largest rigid airship to fly since the 1930s. No matter how often I see the zepp, it always surprises me, a wild bit of entrepreneurial retro-future straight out of Matt Groening’s Futurama. But I am clearly in a minority, as no one else outside the market gave it even a first, much less a second glance. Which is oh, so very Silicon Valley. So accustomed to wonders in their backyard, the Eureka is just another astonishment to be taken for granted by the locals. Eureka is popular enough for locals to pay $500 a seat for the privilege of looking down (though admittedly they are having a hard time keeping their flights booked), but no one can be bothered to look up – they are too busy getting their groceries home to bother with just another amazing invention floating over their heads.